If you could sneak around Hogwarts in an invisibility cloak, where would you go? Well, now that the giant snake is gone we wouldn't mind exploring the Chamber of Secrets. Exploring the many secret passageways would be pretty fun but what we'd really like to do is explore the kitchens. 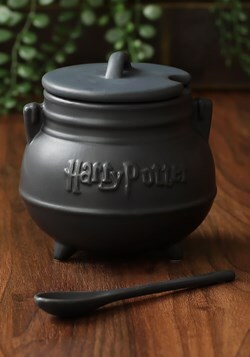 We always were a bit jealous of those magically appearing luxurious dinners in the great hall. Ron seemed to be the only one who really cared about the glorious puddings and we have to respect him for it. 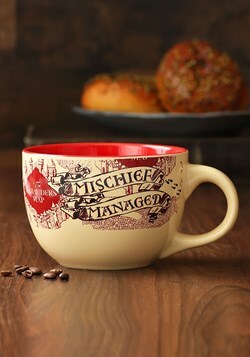 If those wizard kids only realized what a muggle hot lunch was like! 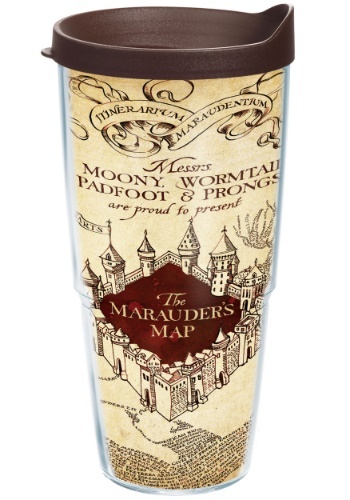 Well, if you were going to sneak into Hogwarts for some luxurious midnight snacking you'd want to be sure to have the Marauder's map with you. Nothing could be as embarrassing as diving full on into a treacle tart only to see Snape turning the corner. Just to make sure you're ready for your chance, this Marauder's map mug will be there for you, adding a little mystery to your hot morning beverage. 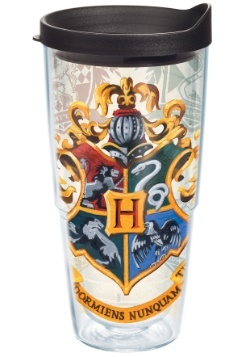 It's illustrated with the instantly recognizable design and twenty-four four ounces of your beverage of choice so you'll have plenty of beverage even if you're making the long trek to Trawalney's tower.